The ‘Options’ consultation has now closed – but this page is kept for information. With regards to the land to rear of Cottage Lane, I have concerns around how much of the site is actually available as potentially some of the indicated area includes existing gardens. In addition as far as I am aware the site indicated is in a range of different ownerships. Parts of the site, particularly the wooded area have been well used by locals from across a wide area – with some of that use possible been sufficient long enough to enable village green or similar application. Additionally the footpath through the middle of the proposed site is well used by locals for access to / from Glossop Road and the adjacent trans Pennine trail which runs along the edge of the site. I object to the proposal for this site, as it will reduce the existing green belt area which is around the Gamesley estate, and whilst it current appears built up this is a temporary development which should be returned to the existing ‘green field’ following the conclusion of the works. In addition the ‘belt’ helps to provide a break from the different built areas of the Gamesley estate and Glossop Road. I support the inclusion of site G26 as an addition that could improve the potential for the adjacent warehouse site (which already has planning permission) to be redeveloped on a quicker basis. However I understand that development of this additional site would add to existing traffic pressures on the road – however it could potentially help to support existing services in the area such as St Margaret’s school which could benefit from additional school age residents in the area. 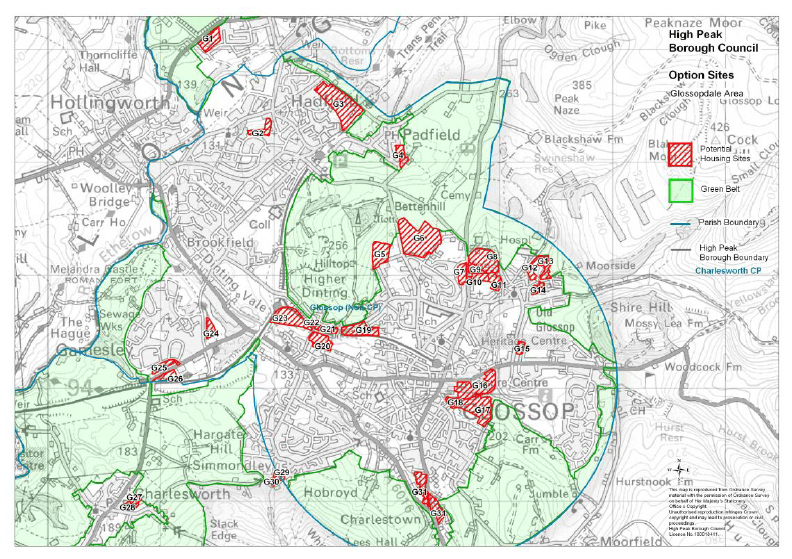 The council has started consulting on a crucial document that will shape development in the High Peak until 2028. The new Local Plan will earmark land for housing, employment and leisure while hopefully protecting the countryside against unsuitable development. Once adopted, the plan will be used to determine planning applications. Which specific sites should be allocated. The consultation will also be asking where new businesses should be located, which areas should be earmarked for leisure or protected from development, and how the council should plan for development of the town centres. To view the options document, you can click here. Or call in at Glossop Municipal Buildings; or visit Glossop libraries. The documents will include maps showing the specific sites that are being considered as options for housing development. The consultation is on until Thursday 25th October and you can respond to it online by clicking here; by email to LDF@highpeak.gov.uk; or by writing to Planning Policy, High Peak Borough Council, Town Hall, Market Place, Buxton, Derbyshire, SK17 6EL. There will also be a special councillor’s surgery specifically on the local plan which will take place on Saturday 20th October from 9.00am until 10.30am in the GRA Office.